So, what does that mean in the context of marketing? It could carry any number of meanings, really. It could be an excerpt from a larger piece of content in the form of a blog post. It could be a fragment from an ebook used as marketing copy. Or, it could pertain to search engine results. It’s that last context that we’re here to discuss today — specifically, the featured snippet, and what people think of. What is it, and can it be trusted? A featured snippet is a summarized response to a search engine query that appears on top of results. 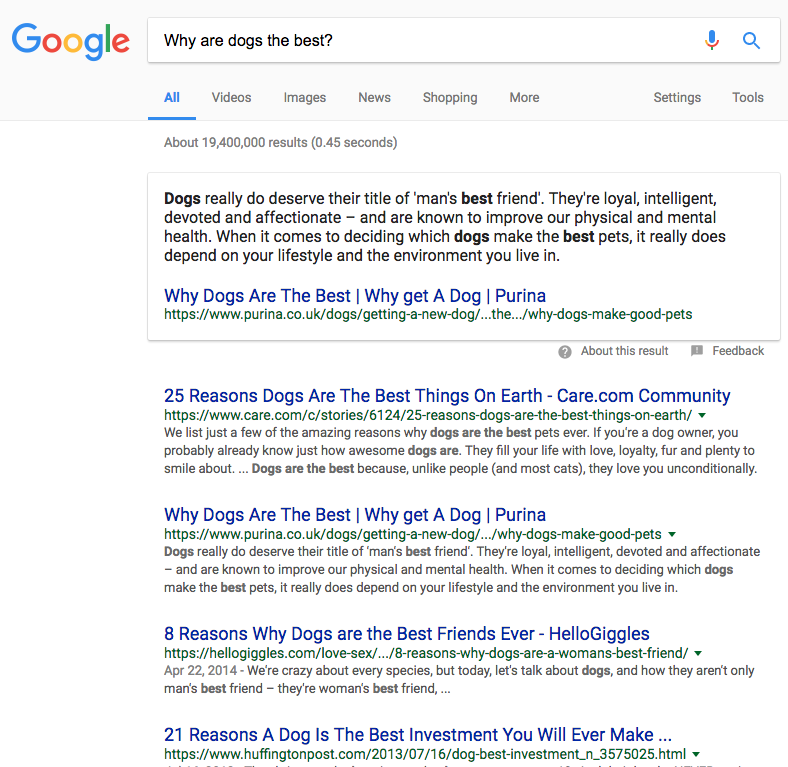 It’s pulled from a page’s content to include the text that Google believes will best answer your question, and is displayed with the page title and URL. In this instance, the page that was used for the featured snippet happens to be the top-ranked one in the search engine results page (SERP) for this query. But, that isn’t always the case — and Search Engine Land recently reported that Google is testing the option to remove featured snippet pages from the following results altogether. While the featured snippet page still ranks well for this query — it’s in the #2 position — it’s not the top result. So, keep in mind: a featured snippet does not always equal a top rank in the SERP. Here’s another thing to keep in mind if you’re striving to snippet-ize your content: The featured snippet isn’t perfect. 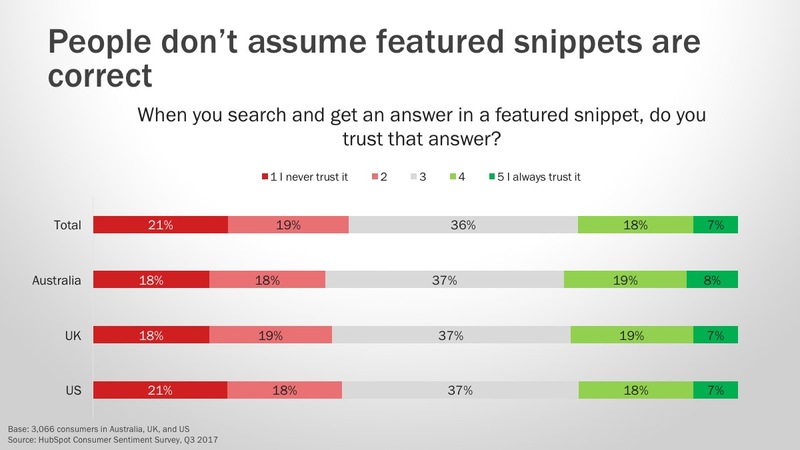 When we recently surveyed consumers in Australia, the UK, and the U.S., we discovered that only 7% of respondents consistently trust featured snippet results. Compare that to the 21% who never trust them, and the 36% who are neutral about them. 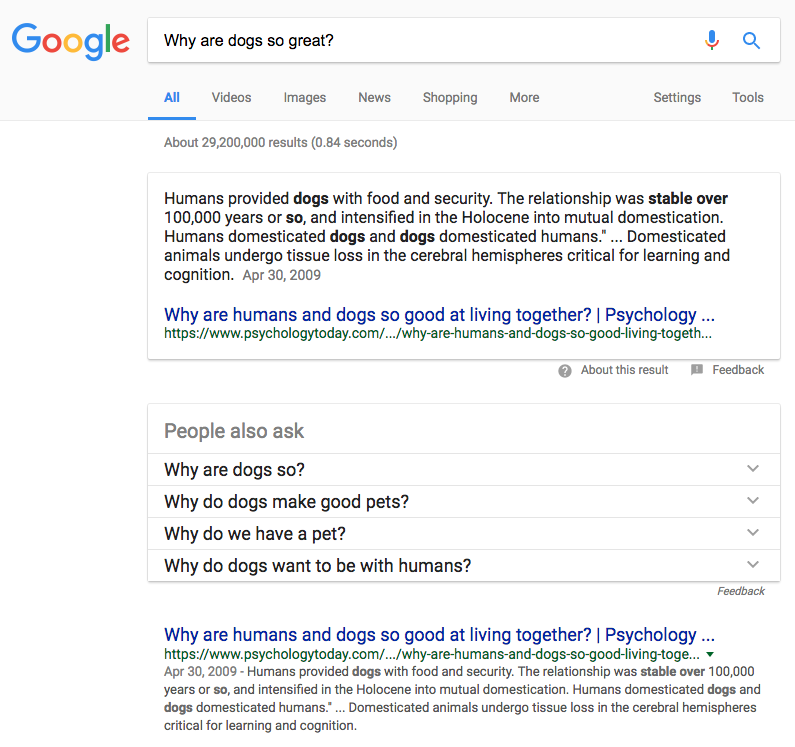 While the featured snippet gives me some nice information about the history of dogs becoming domestication, it doesn’t really tell me anything about what, specifically, makes them such great little creatures. 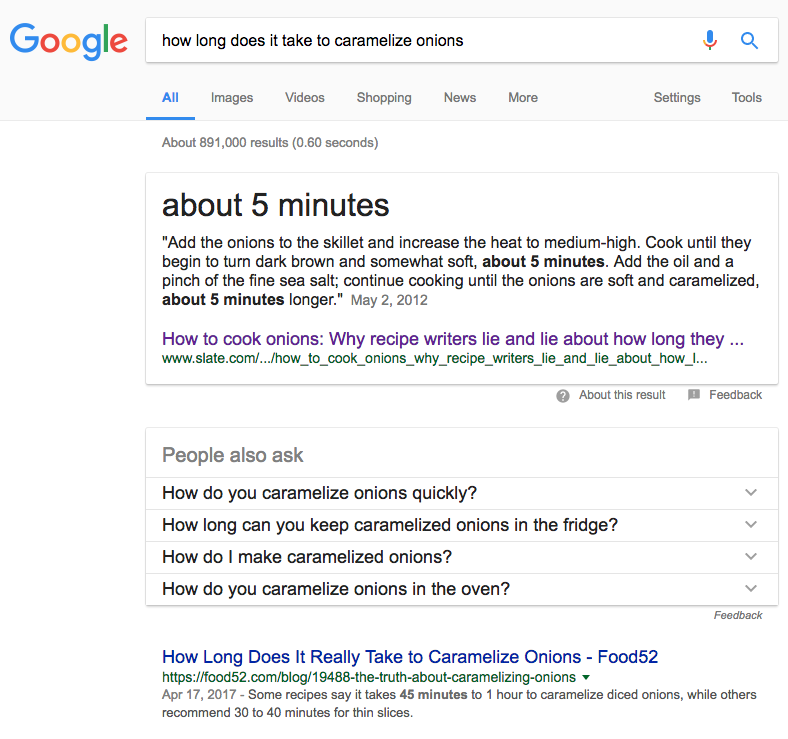 The large, prominent text in the featured snippet clearly reads, “about 5 minutes.” That text was actually pulled from an article about how inconsistently recipe writers indicate the time it takes to caramelize onions. In fact, the text quoted in the featured snippet was quoted within the page from a recipe pointed out for its incorrect cooking times. Granted, these are fairly low-risk queries. The world isn’t going to end if, say, I undercook my onions because Google told me to — though it might make for a less-than-pleasant dinner party. But there are instances when inaccurate featured snippet results carry greater consequences, such as when a featured snippet displays completely false information about history and current events, leading to a risk of widespread misinformation. While most of the examples featured in it have been corrected, back in May, Search Engine Land published its own list of instances where the featured snippet got things very, very wrong. In other words, there’s good reason to take featured snippet results with a grain of salt as a searcher. As a marketer, however, it could be worthwhile to invest some time into optimizing your pages for the snippet — ethically, of course, and with accurate, truthful information — since they’ve shown to beat out even the #1 ranking result in the SERP below them. Like many of its algorithmic initiatives, Google is likely continuing to iron things out on the featured snippet front. As always, we’ll keep an eye on things, and let you know when we observe key takeaways.